photo: unknown. From Evgenij Kozlov's archive. At the end of Gorbachev's Perestroika Lenin, the omnipresent icon of socialism, could be criticised more openly. In 1989/89 Evgenij Kozlov created "Lenin with red eyes" which gave Lenin a rather diabolic look. Additionally, he created several paintings, among them "Lenin in Leningrad" and "Lenin in New York". "Большой Ле-е-нин" – "The Great Le-yeh-nin", was the largest of these works. For his installation Evgenij Kozlov created a separate space confined on three sides with Lenin banners. 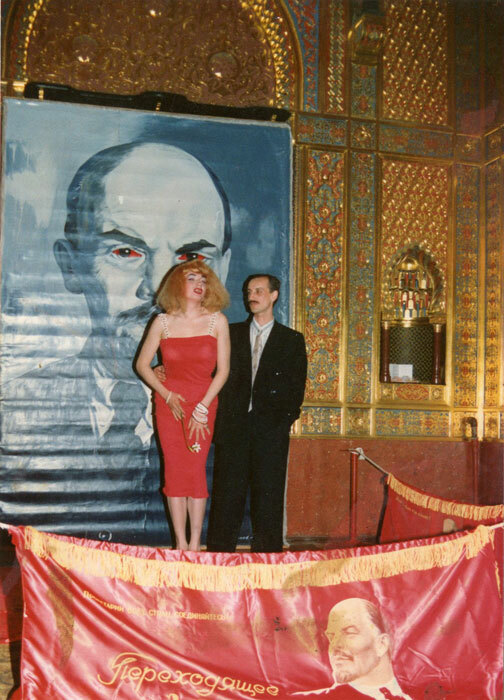 Such Lenin banners were produced with red shining acryllic fabrics and golden applications and fringes, in an attempt to copy church banners, for which the combination of red and gold is of great symbolic value. The "Sacred Lenin Banner" was a popular hymn performed by the Red Army Choir. What is more, the image of Lenin stands in the place of Christ, a clear indication of the fact that during Soviet communism Vladimir Ilych Lenin became a subsitute for Christ the Redeemer. Accordingly, criticism of Lenin was considered blasphemy. Evgenij Kozlov's installation carries this idea to the absurd. The effect of the red colour is enhanced by Vladislav Mamyshev-Monro's dress, his bright red lips and, of course, Le-yeh-nin's red eyes. Despite many different uses over the years, the Moorish room of a former mansion belonging to Baron von Dervis (Мавританский зал особняка барона фон Дервиза) has preserved its splendour. In 1946 the building became the "Mayak House of Culture", since 2003 it is home to the St. Petersburg Opera.